Some claimed increasing horse numbers globally since a 50-year low in 2002 . But the global increase in horse numbers after 2002 was not extraordinary compared to the short-term fluctuations of the recent past. The rise in horse numbers since 2002 fell short of historic highs (see graphic). 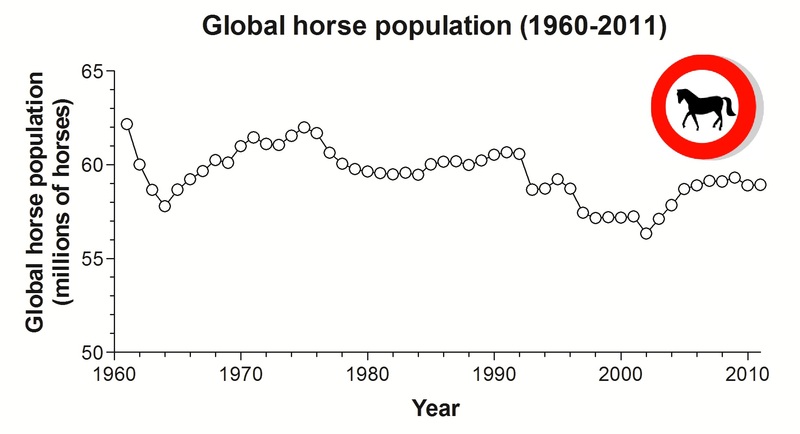 Annual changes in the global estimate of horse number over the previous 50 years. Source: Food and Agriculture Organisation (FAO) of the United Nation, www.fao.org. There were similar increases in the global population of horses during the mid-1970s and early 1990s but they too did not produce new highs. The overall trend, therefore, in the world’s horse population is one of gentle decline. From about 62 million horses in 1960, the global population is now about 59 million. More interesting than this global trend, however, is whether the trend is different in different countries and the reasons why. What nations contribute most to the global decline? Are there nations that defy the trend by maintaining, or even increasing, horse numbers? Why might some nations’ horse populations be increasing or static while others are decreasing? We know that the horse is more important in some regions than others. We know now that horses are extraordinarily more common and dense in some nations than others. But how might the distribution of horses around the world change over the next 50 years? And will they continue to decline globally? In following posts I will examine the changing numbers of horses in different nations, try to understand the reasons for the pattern, and use that understanding to think into the future of horses on the planet.